Chhori started walking independently a couple of weeks ago. It only took her a few days to go from a few steps to nearly running now. We love to watch her walk as it is so cute. The fun part these days is when I return home from work. When she sees me entering the door, she leaves whatever she is doing and comes running towards me saying “Hi” and hugs me. I love these moments even though they happen every day. Since she started crawling, we taught her to get stuff and give it to us. When she does we say “Good girl” and pat her head. 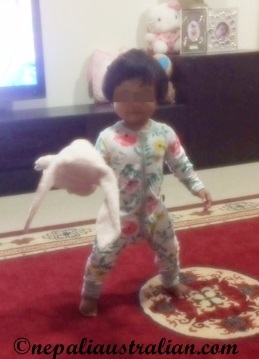 It is fun to play with her like that and now that she has started walking it is even more fun as she happily goes and bring stuffs and once she puts that on our hand, she pats herself on the head doing the “Good girl” action. The other day I was in the balcony putting the clothes on the line to dry. She came outside and started passing me the clothes from the bucket. I couldn’t feel more happier. She has started to become my little helper. Long before I had kids, I used to think one day I will have kids and they will help me in the kitchen doing baking or cooking or any other house chores and now it has started. I know most kids hate to do chores when they grow up but I will enjoy these moments for as long as they last :). I hope we can raise her so that she will enjoy the chores and accept it as part of her life. If nothing works, I plan to bribe her but these days she just does it happily. Hope she will stay like this forever as I am enjoying every minute of being a mum to such a cutie pie. Do your kids help you out around the house? Do you give them something in return? Is there a trick to getting them to help you? This entry was posted in Being Mum and tagged Australia, australian, baby, chores, cuite pie, kids, kids helping, M from nepaliaustralian, mum, Nepal, Nepali. Bookmark the permalink. Good morning/evening, Supermum. Your post is great and Chorri is really cute. I found Nepalese kids to be more helpful towards their parents than European kids. I think it depends on the society they grow up in. The best kids I ever saw were in the village, Gorkha and Syangja. They just grow up feeling that helping and sharing are their responsibility. But times are changing even in the Nepalese hillsides. I had a nephew from a Nepalese mum and he was a fantastic child, a real model child but only until he went to secondary school. Then he went down and down, and under influences from his awful classmates he got involved in petty theft and turned a bit rotten. But after he left school he seemed to correct himself and became a good guy after all. School is not always the best place to be educated. Thankyou Dai . I am planning to teach Chhori that sharing household work is normal part of living so she doesn’t grow up to be spoilt child who thinks she deserves everything without doing anything. Hope we will accomplish that. I have seen lots of parents go and buy any toys the kids want and they don’t seem to appreciate them as they didn’t have to lift the finger of the toys. I want Chhori to appreciate what she have as we grow up not having a lot and we value everything in life now. I am so pleased to hear those words. I am also someone who appreciates what I have. I also highly appreciate that I am typing this and can send it instantly to Sydney. I think that western children have far too much and it is sending them in the wrong direction. Good on you that you will teach them the value first.